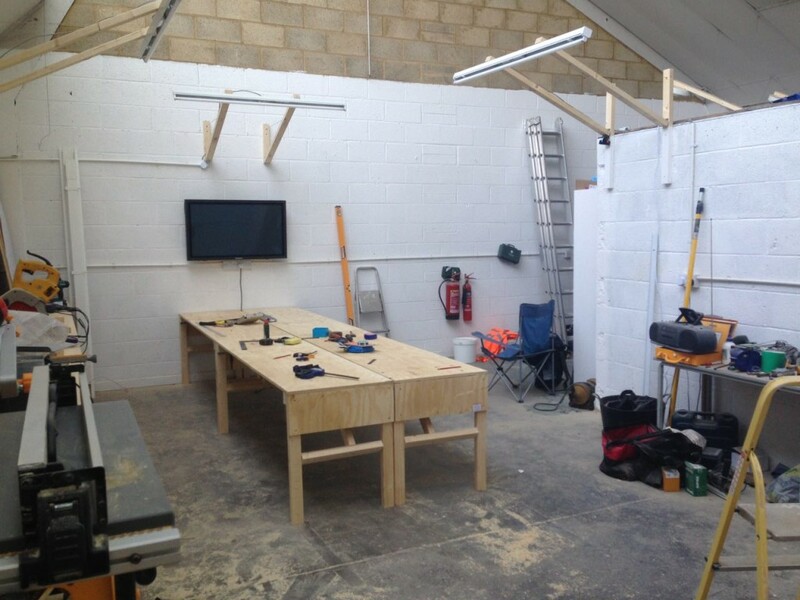 Desks, Whiteboards and Sofa, oh my! 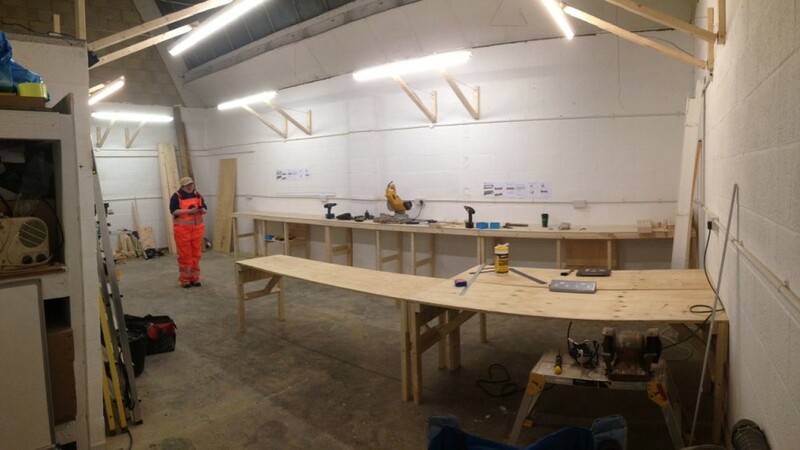 Progress so far has been at breakneck speed, at least for us amateur part time chippies, sparkies and brickies. When we last left you we were building 5m of side benches. 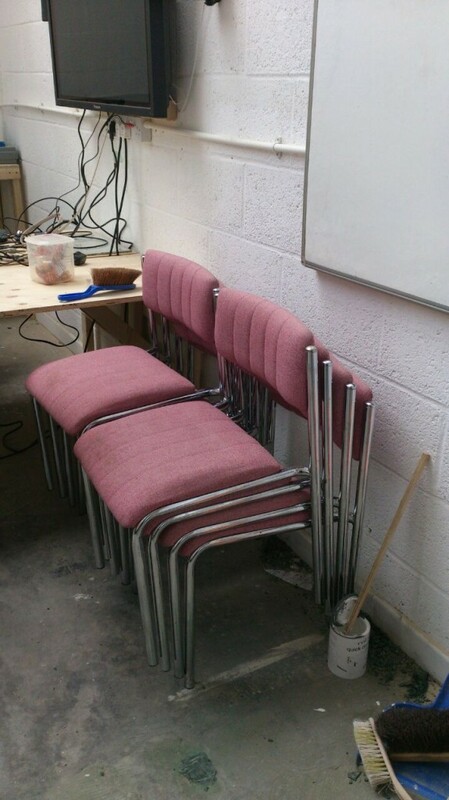 These have now been finished and next it was onto the barstools and desks. We were building them as fast as we could design them. Click on the plans below to download them. The great thing about the desk design is that they can collapse and fold flat for storage against a wall, thus leading to a more adaptable and flexible space. Building our own furniture is not only fun but cheap and a consistent theme can be achieved throughout the space that only a professional could achieve at many times the cost. Sure, it looks functional and slightly bohemian, but we love it. One of the things that throws a few spanners at the work plan is donated equipment that happily needs to be shoehorned into the fit-out. 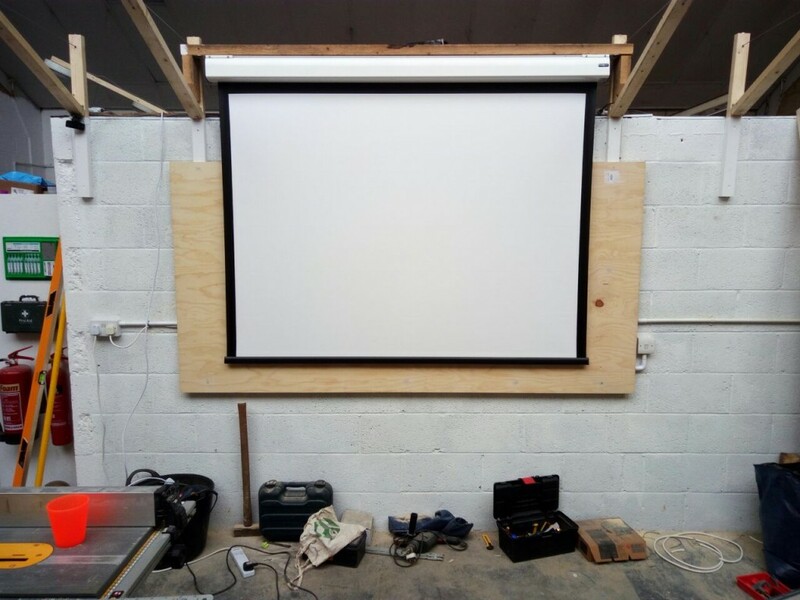 We were donated a plasma TV, projector and electric screen (yay) and not hanging around, we fitted these asap. 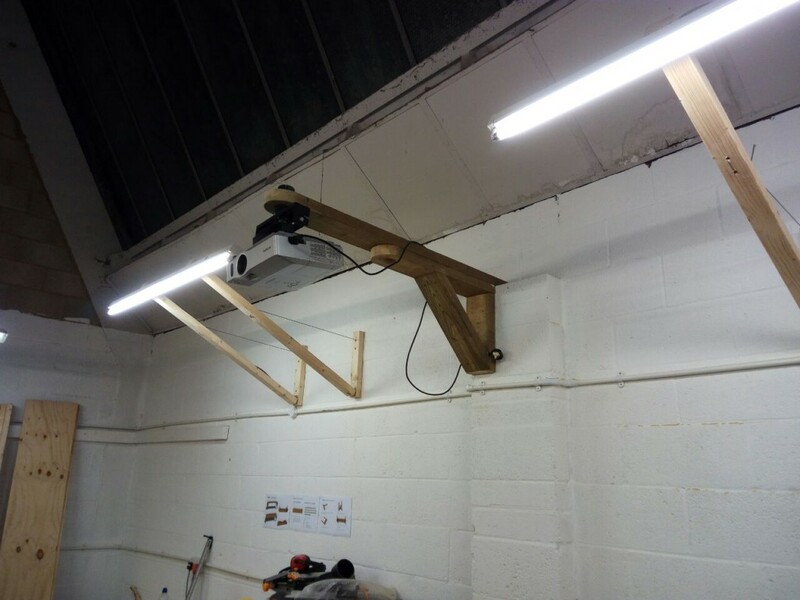 The projector bracket was made and then had to be extended because the throw of the projector wasn’t long enough leading to the projected image being too large. The screen is plugged in on the left and switch operated on the lower right for up and down. The big wooden board behind the screen was turned into a giant whiteboard with the help of some whiteboard wallpaper and a nicely trimmed border. 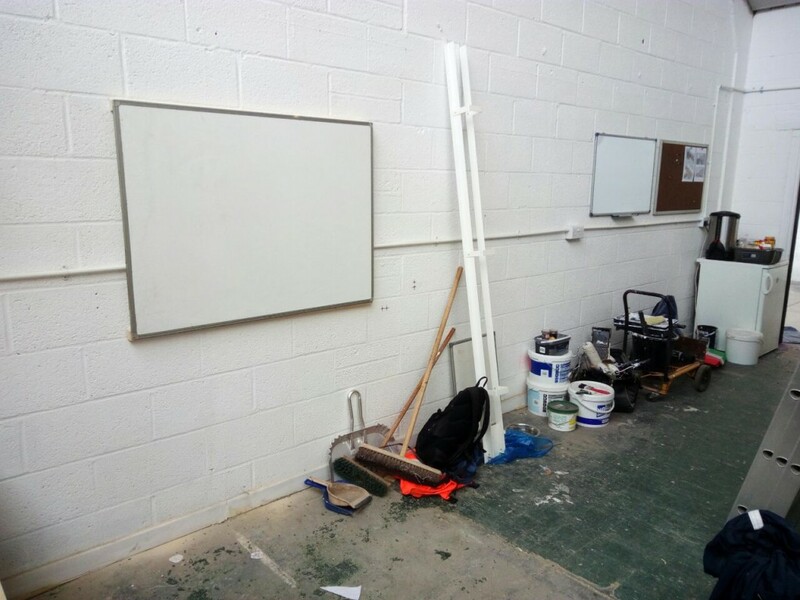 Not content with just one massive whiteboard, we put up two more plus a pin board for member messages and notices. Besides barstools we need comfy chairs for comfy bums, bought cheaply from Swindon Scrapstore. Not quite our colour scheme but bums don’t have eyes. In the entrance hallway we are planning to have a comfy sofa and a little kitchenette worktop to make teas coffees etc and be generally a bit more welcoming. Above the sofa between the white boards we will have some small display shelves. 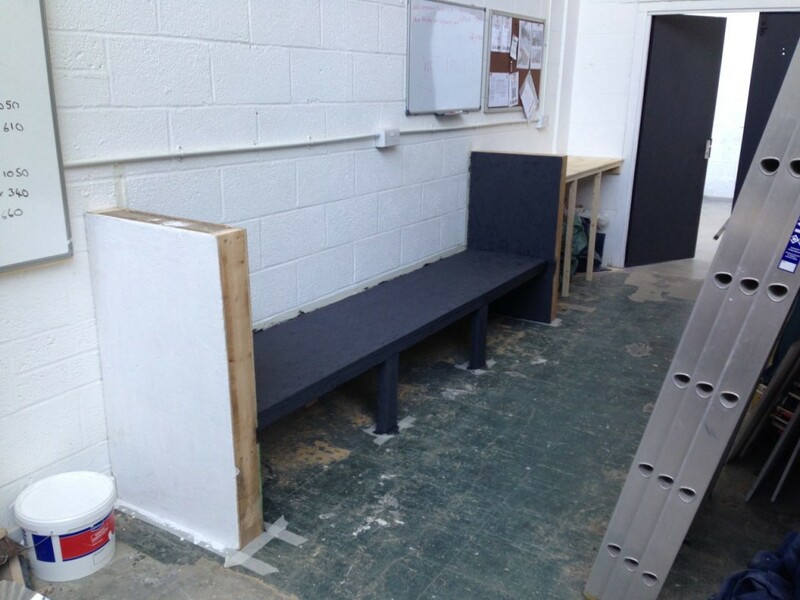 The cushions are currently being upholstered, so we also offer our thanks for this kind donation too. On a final note, we all feel secure now that we are protected by our wall of safety. 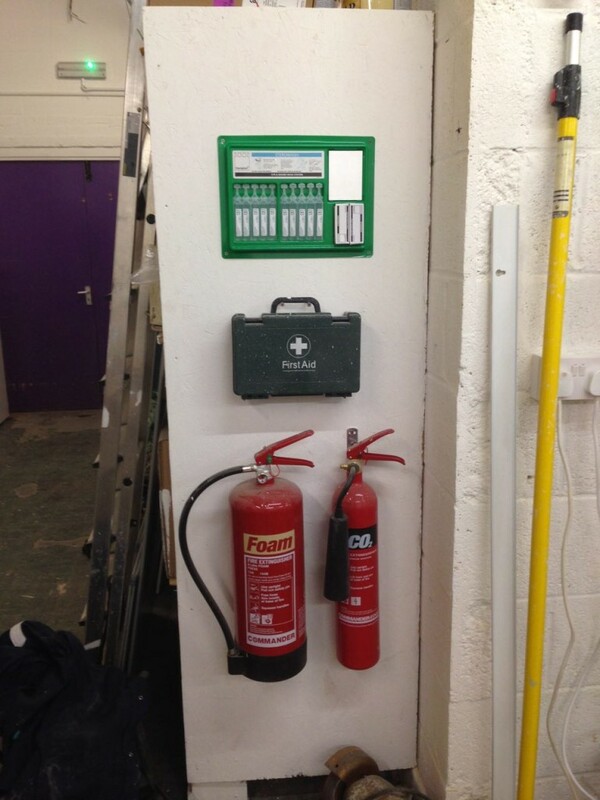 Emergency lighting also in the background. 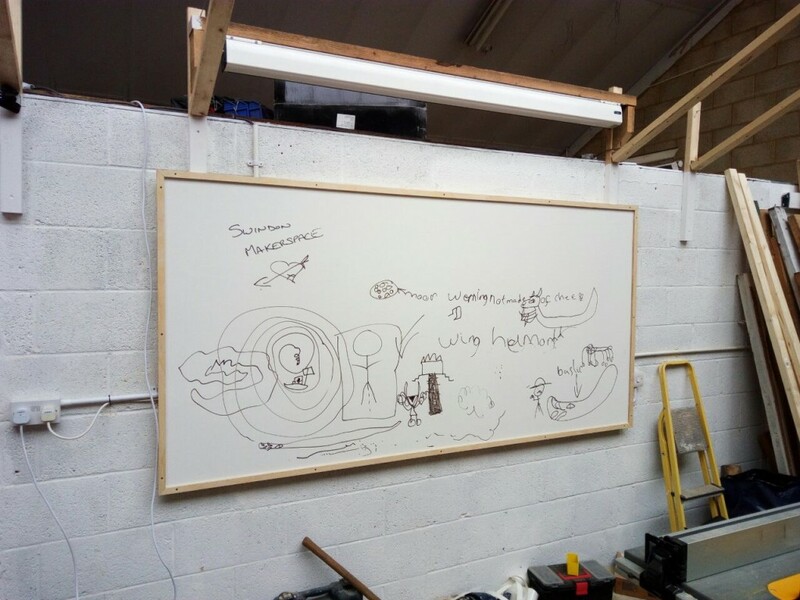 This entry was posted in Refurbishment and tagged Makerspace, Making, Projects. Bookmark the permalink. Oh…your website complained that comment was too short, =P.